Cracking weather and a pitch at its best. Apply onto that canvas two very talented teams and you can picture the perfect start to a British Inter-county Championship game. By the time talented young piper Sean Warr finished Amhrán na Bhfiann, the atmosphere had been well and truly, set in place. The start of the game reflected this, both squads trying to settle into things. When the deadlock was broken, it came from range, after a nicely worked point by Lancashire. Scotland responded after this, dominating possession and territory for the next few phases. It looked for a time, as if they were not going to make it count (two powerful shots on goal were stopped by big Lancashire goalie Paul Noone) until Niall Horkin pounced on a high ball and found the net. A flurry of Lancashire points were followed by another Scotland goal. This one drilled from the edge of the square by David Mc Comesky. If that unsettled Lancashire then they certainly didn’t show it. Their response looked straight off the training ground and finished with a fine point. Lancashire almost got the rub of the green when, under a high ball the Scotland goalkeeper slipped. Sheehan had to watch helplessly as it bounced in front of him. However, to the relief of the home side it somehow managed to bounce and go over the bar, rather than under. That finished the half 2-3 to 0-5 in favour of the Scots. Half-time saw Mc Nulty send Scotland back to the changing rooms while Lancashire chose to remain on the pitch. The heat was having an effect on proceedings and there was little relief from the light breeze. It was potentially a good call from the former Tyrone Minor. The second half started with a point from the Scots. They would go 12 minutes of play before their next one. Lancashire were turning the screw with control of the possession and territory. Lancashire chipped at Scotland’s lead but likely should have made more of their opportunities from free kicks. Scotland looked very content throughout this phase, to sit back and force Lancashire errors. Thirteen minutes into the half and with the gap closed to three points, Mc Nulty rang the changes. Within a minute Scotland found momentum from a kick out and located Peter Smart in space on the right flank. A mammoth shot from Smarts boot, curled its way between the sticks and ended Scotland’s scoring drought. The game stayed pretty nip and tuck with the sides trading points. Play broke down a number of times as tempers grew that bit shorter. The heat was, again potentially making its impact on the game felt. The killer blow was landed when a Scotland shot, which looked to be heading over the bar, hit the crossbar. Tipperary man Adrian Dawson pounced on the ball. As he started to wind up, the goalie, with few options left, brought him down. The price was high. He received a red card and Derek Harvey converted from the penalty to put Scotland ahead 3-8 to 0-11. Play returned but remained stop-start. Referee Ronan McCann was given plenty of work by both sides for the closing moments of the match. The fractious play continued, until the Kildare native blew the final whistle. 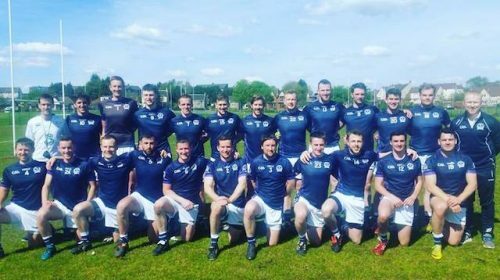 The result gave Scotland their first win since 2016. It was a fine game to kick off a championship and both teams will have learned much. All eyes, will be on the draw when it comes. Scotland will be keen to continue their form and Lancashire should prove dangerous opposition when they play to get their championship back on track.